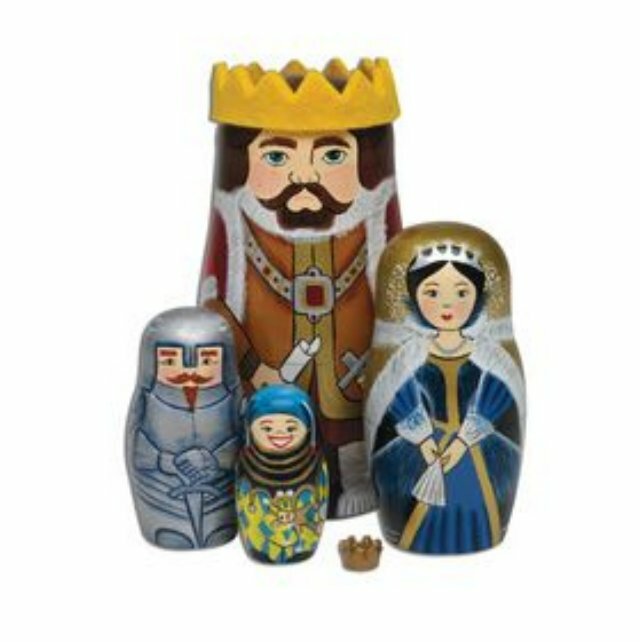 This Royal Court nesting doll features a king with a felt crown, his queen in splendid blue dress and golden cape, a knight in shining silver armor, and a jester. Inside the smallest doll is a tiny golden crown. Set contains 5 pieces including the crown, largest doll measuring 6" tall. This was the last nesting doll produced by Bits and Pieces catalog. On March 18, 2008 their owner company Big Sky Brands, Inc shut down the catalog and laid off all staff of Bits and Pieces, and sister catalogs such as The Paragon.